Home / News / Trending Article / Trending Events / Trending News / Trending Updates / Updates / Viral / Viral Article / Viral Events / Viral News / Viral Updates / 2 NAIA security personnel kinasuhan na ng pagnanakaw. 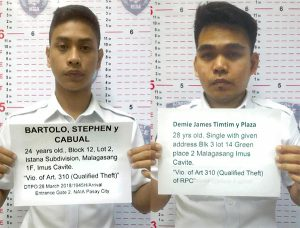 2 NAIA security personnel kinasuhan na ng pagnanakaw. MANILA — Two personnel from the Office of Transportation Security (OTS) were charged with theft after they admitted stealing money from a Japanese tourist during a baggage inspection at the Ninoy Aquino International Airport (NAIA) Terminal 3’s departure area last week. 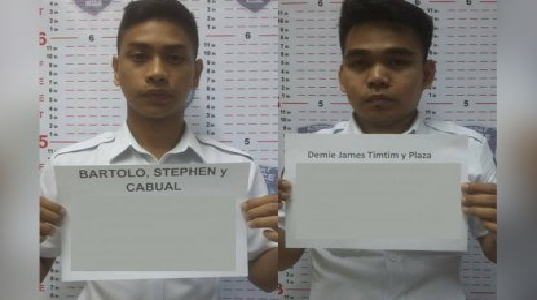 OTS intelligence agent-aides Stephen Bartolo and Demie James Timtim admitted to conspiring to steal 1,700 Australian Dollars (AUD) or roughly PHP68,000 from Japanese national Yuka Sakata. Both intelligence aides were included in the personnel “stop list” by the Manila International Airport Authority (MIAA) and had their NAIA passes revoked, a statement from the Department of Transportation (DOTr) said Monday. Sakata was at the pre-departure area for his connecting flight to Cebu when he discovered that the money in his hand-carry was missing on Wednesday (March 28). Airport police and security officers provided assistance to Sakata and conducted a reenactment of the incident where he identified Bartolo as the one who conducted the baggage search at the arrival gate. Bartolo admitted during an inquiry that he took money from Sakata’s wallet after a CCTV footage was shown that he took something from the bag of the Japanese national and placed it in the pocket of his pants. He immediately returned two pieces of 50AUD. The intelligence aide also revealed that he gave some of the money to his colleague Timtim, who was the incoming duty personnel at the arrival area. Four pieces of 50AUD were recovered from his jacket. DOTr Secretary Arthur Tugade expressed outrage over the incident. Advertisement “Mga sira-ulo yan. Nakakahiya! Ipakulong yan! Nakasisira sila ng imahe ng mga airport natin at pati ng buong Pilipinas. Sayang ang pagpapagod ng buong DOTr upang maituwid ang baluktot kung may mga kurakot at magnanakaw pa rin na kagaya nila! Sisiguraduhin kong mapaparusahan ang mga ‘yan at hindi na makatatapak pa sa ating mga paliparan,” Tugade said. For his part, MIAA General Manager Ed Monreal warned that the full force of the law will be imposed against corrupt airport personnel. “We will not tolerate corruption and theft in NAIA. I encourage our passengers to report to us incidents like this, and I will make sure that these personnel will have their time in jail,” Monreal said. MIAA and OTS will continue to conduct their investigation on the incident. “Authorities are still investigating where the balance of the money is. We just need to make sure that the claim that the AUD 1,700 stolen from the Japanese national is true,” DOTr Public Information Office Director Godess Hope Libiran said in a text message to the Philippine News Agency (PNA). DOTr, MIAA, and other airports in the country have been directed by President Rodrigo R. Duterte to put a stop to baggage theft and pilferage. New guidelines are being implemented for personnel in charge of passenger baggage handling. Baggage handlers should wear body cameras as airport officials were asked to produce an initial 100 cameras, while security companies were also directed to buy their own. Personnel on duty are likewise no longer allowed to bring or use cellphones nor wear jewelry. Their uniforms must not have pockets, while their boots or shoes must not be loose. Ground handling companies were also warned that should any personnel of theirs be found guilty of theft, the company’s contract will be suspended or terminated.